Background: The lethality of prostate cancer is mainly due to metastasis. Inhibition of metastasis is expected to be a promising approach for prostate cancer therapy. Phosphatidylinositol 3-kinase (PI3K)/Akt pathway is reported to be closely involved in cell growth, migration, etc. Objective: The study investigated the antimetastatic activities of pan-PI3K inhibitor ZSTK474 on DU145 cells. Methods: 1. The In vitro effect of ZSTK474 on the migration, invasion and adhesion of DU145 cells was determined with Transwell migration assay and wound healing assay, Tranwell invasion assay and adhesion assay, respectively. 2. In vitro effect of ZSTK474 on the signal proteins in DU145 cells was determined with Western blot analysis and ELISA. 3. Moreover, the In vivo antimetastatic effect of ZSTK474 was evaluated with MicroCT and histology analysis. Results: ZSTK474 potently attenuated the capability of migration, invasion and adhesion of DU145 cells, negatively regulated Girdin, Integrinβ1 and matrix metalloproteinases (MMPs). In addition, the expression of hypoxia-inducible factor-1α (HIF-1α) and vascular endothelial growth factor (VEGF), which are known to be related to angiogenesis and metastasis, was also inhibited. Oral administration of ZSTK474 (200 mg/kg) ameliorated in vivo bone metastasis of DU145 cells, with improved bone structure and bone mineral density (BMD). 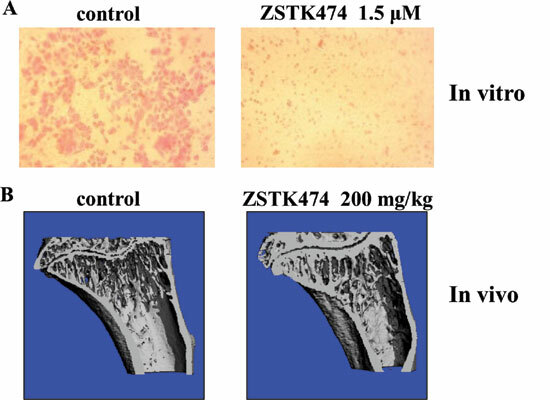 Tissue staining indicated a reduction in metastatic DU145 cells and osteoclasts in the bones of ZSTK474-treated mice, compared with the non-treated group. Conclusion: Our result demonstrated the antimetastatic activity of ZSTK474 on prostate cancer DU145 cells, suggesting the potential application in prostate cancer patients. Keywords: PI3K inhibitor, ZSTK474, antimetastasis, in vivo, DU145, prostate cancer. Keywords:PI3K inhibitor, ZSTK474, antimetastasis, in vivo, DU145, prostate cancer. Abstract:Background: The lethality of prostate cancer is mainly due to metastasis. Inhibition of metastasis is expected to be a promising approach for prostate cancer therapy. Phosphatidylinositol 3-kinase (PI3K)/Akt pathway is reported to be closely involved in cell growth, migration, etc. Active Surveillance for Low-risk Prostate Cancer: Are All Criteria Similar?